- IR Night Vision:Equipped with IR sensor and LED, day or night, rain or shine, the camera can automatically switch the light to ensure you a crystal view. Night Vision - Protect your home day and night with infrared night vision. Keep your home safe at night. - Smart PIR Motion Detection:Detecting the slightest motion in front of the door. Low, midium and high sensitivity within 11.48ft for you to choose. Get instant alerts when visitors press your Doorbell or trigger the built-in motion sensors. - Wireless Wi-Fi Connection:2.4GHz Wi-Fi Connection - Keeping your doorbell always online. No wires and cables are required, just download the APP, then connect it to your doorbell, keeping your doorbell always online,You can just sit on your couch or lie on your bed seeing and talking to the visitor in front of your door. - Easy to Install & Service Guarantee:- Equipped with a free 16G memory storage and an indoor dingdong chime.Compatible with iOS and Android mobile devices, and Mac and Windows PCs. 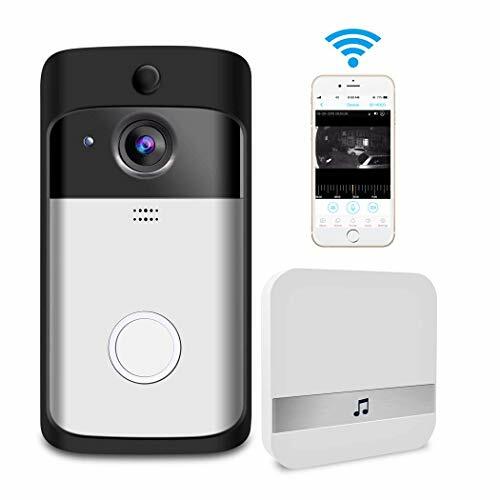 Watch over your home in brilliant 720P HD video.doorbell provides 12-month warranty and professional after-sale service within 24 hours.